It turns out that being a billionaire presidential candidate who regularly objectifies women, refers to much of his country’s largest ethnic group as “rapists” and “criminals,” calls its democratic system “rigged,” proposes a ban on all immigrants who practice a particular religion, picks a fight with the parents of a soldier killed in action, then blames everyone but himself when people don’t like him for it is not only hurting Donald Trump’s poll numbers, but his pocketbook too. New York City-based Foursquare Labs Inc., which according to the company still has 50 million monthly users logging into its signature location-based recommendations app, has used what it calls “foot traffic intelligence” to measure whether the Donald’s political campaign has Trumped his hospitality business. 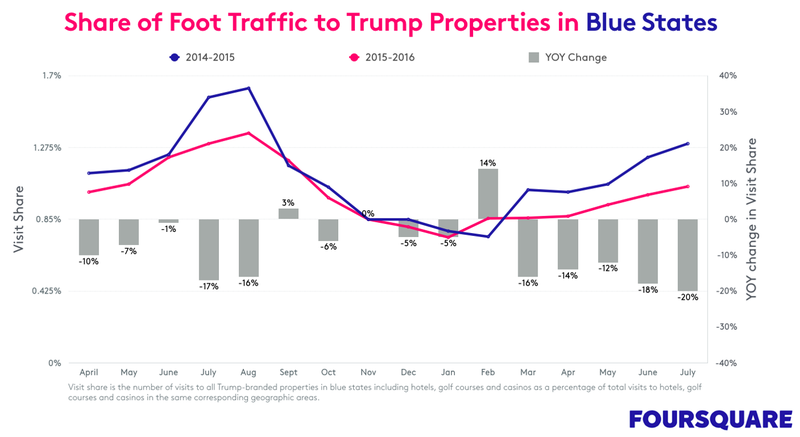 The answer is (for Trump) painfully clear: year-over-year attendance at Trump-branded hotels, casinos, and golf courses in the U.S. has been falling since he announced his candidacy last June, and the drop has only become steeper since spring. 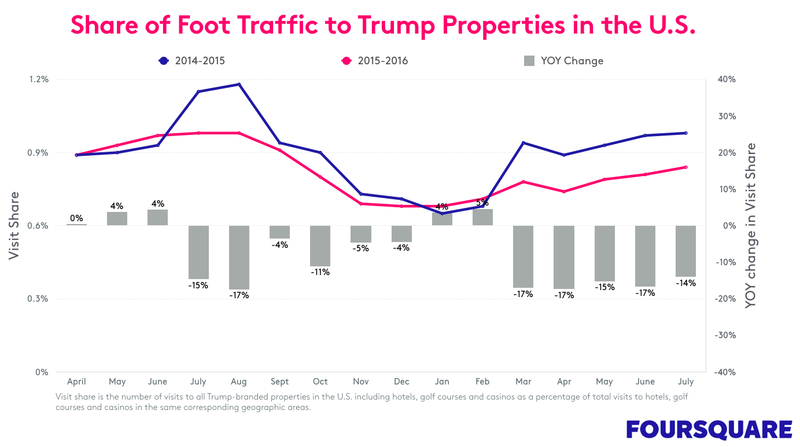 In August 2015, attendance at all Trump-branded properties fell by 17 per cent from the year before. It fell by 17 per cent year-over-year in March 2016 too, when Trump was on the primary campaign trail saying that women who receive abortions should be punished, instead of receiving what Foursquare called a “springtime bounce” from travellers and locals. The properties that were hardest hit were the Trump SoHo, Trump International Hotel & Tower Chicago, and the Trump Taj Mahal, which declared bankruptcy yesterday – all three experienced a drop in foot traffic of between 17 and 24 per cent year-over-year, Foursquare said. 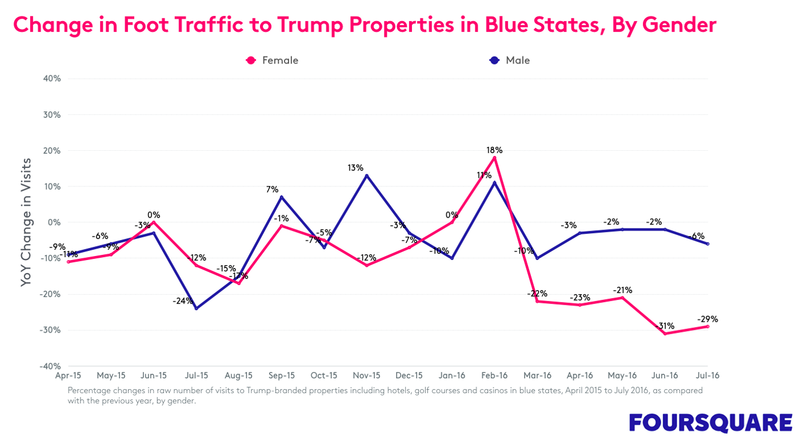 Unsurprisingly, the loss in foot traffic was higher in New York, New Jersey, Illinois, and Hawaii – so-called “blue states” that Trump is projected to lose – and even higher among women. The swing states, Foursquare noted, have fluctuated but appear more favourable for Trump’s brand: during the Republican Convention in July, for example, visits to his properties in Las Vegas and Miami dropped by only three per cent year-over-year, after dropping by 20 per cent year-over-year in June. As for how Trump’s opponents and supporters should interpret this information, Foursquare admits that as a location intelligence company it would rather leave the analysis to pundits. To analyze foot traffic patterns at Trump’s properties, Foursquare included both explicit check-ins and implicit visits from users of its apps who had activated location tracking on their devices. “Regardless of how you feel about the election, we hope our data analysis encourages more people to pay close attention, and illuminates how technology is opening up new kinds of societal understanding based on mobile usage,” the company wrote.